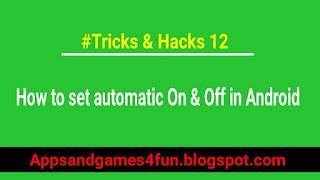 In this article I will tell you how to set automatic On & Off in your Android. But why should you do this? 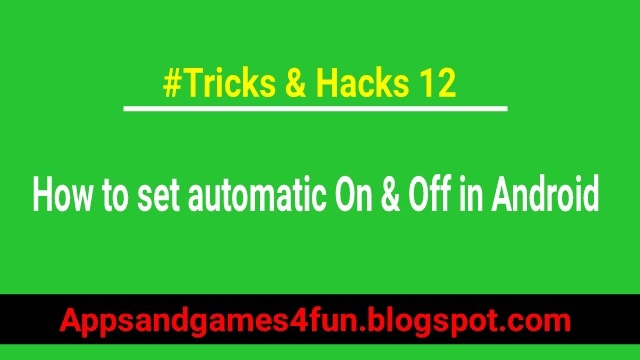 This trick is helpful for those people who want to keep their phone on and off for a certain time. Like if you want to power off your mobile during meetings or office working hours and want it to turn on automatically at a specific time? And also if you want to turn on and turn off your Android phone without the power button? you can do all the above with the built-in feature of Android. "Scheduled power on & off" feature helps us to auto power on and auto power off the Android phone at a specific time. 2) Under "System" section, tap the Scheduled power on & off. 3) Now, you can see two options. The first option is for Scheduled power on and the second option is for Scheduled power off. 4) Click on the first option. 5) Select the Repeat frequency as per your need. 6) After you select both options, click on "Done" at the bottom. You can see the Scheduled power on is enabled. 7) Click on the second option. 8) Click on "Done" and you can see the Scheduled power off is enabled. Now your Android will automatically on and off as your set schedule. If you liked this article, please comment.